Amer F. Ahmed, Ed. D., is an individual with an eclectic personal and professional experience. 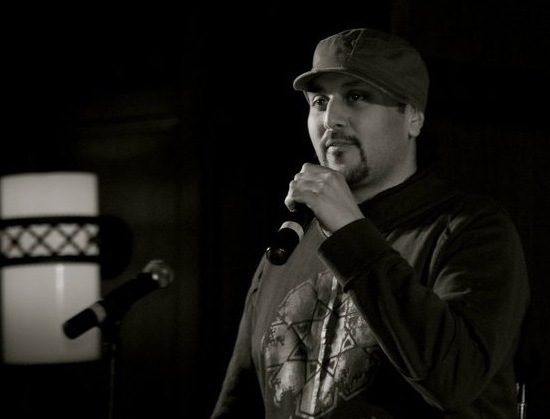 As an intercultural diversity consultant, college administrator, facilitator, poet and Hip Hop activist, he channels his diverse experiences into work geared towards effective change serving to create mutual benefit for all. Born in Springfield, Ohio to Indian Muslim immigrants, Amer has dedicated his life to engaging and facilitating diversity across human difference. His studies in Anthropology and Black Studies have been enhanced by powerful study abroad experiences in South Africa and Nepal. His education, world experiences and his Indian-Muslim-American upbringing helps him understand the need for respect and dignity of all people. 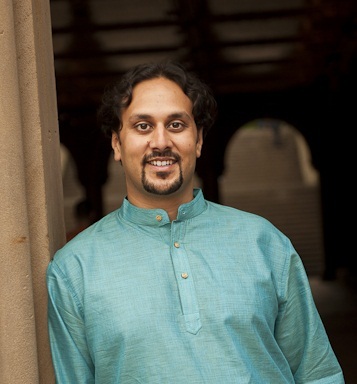 Amer has served as Director of Intercultural Programs at Loras College in Dubuque, IA and Concordia College in Moorhead, MN before moving on to University of Michigan and later to Swarthmore College. His professional experience provides him with unique perspectives on Diversity and Inclusion policies and practices in Higher Education and numerous other professional contexts. Amer is also a prominent national speaker invited to numerous campuses, conferences and institutes to speak on his diverse areas of expertise. He also has been featured on MSNBC’s “Melissa Harris Perry” show and in “Cracking the Codes,” a documentary film on racism directed by Dr. Shakti Butler. His writings have appeared in numerous publications. 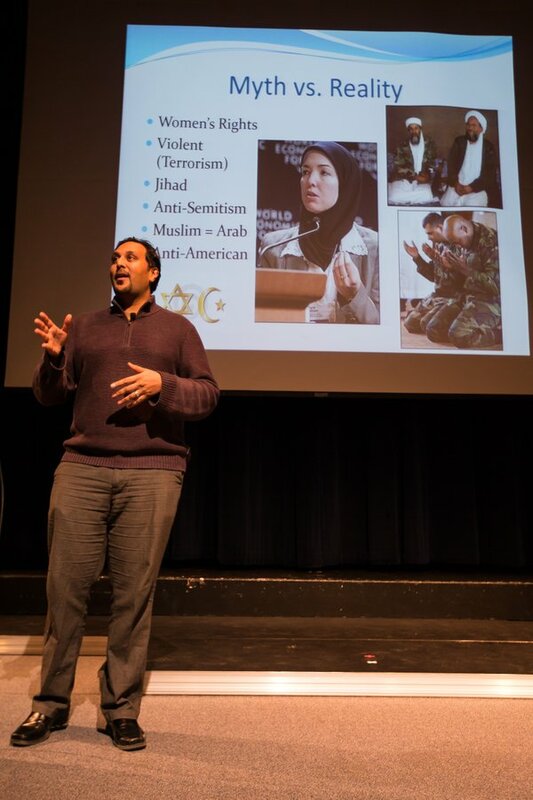 Among his many areas of expertise, Amer has most prominently been engaged as a unique resource to address issues related to Islam, Islamophobia and interfaith issues. Throughout his career, Amer has consistently addressed all forms of marginality that impact how individuals experience institutions and issues of social justice that continue to face traditionally marginalized communities. In addition, he bridges this work with the field of Intercultural Communication emphasizing developmental approaches to Intercultural sensitivity. Such approaches have been useful in his work on Organizational, Leadership and Student Development and Assessment as well as in Workshop facilitation and Public speaking. 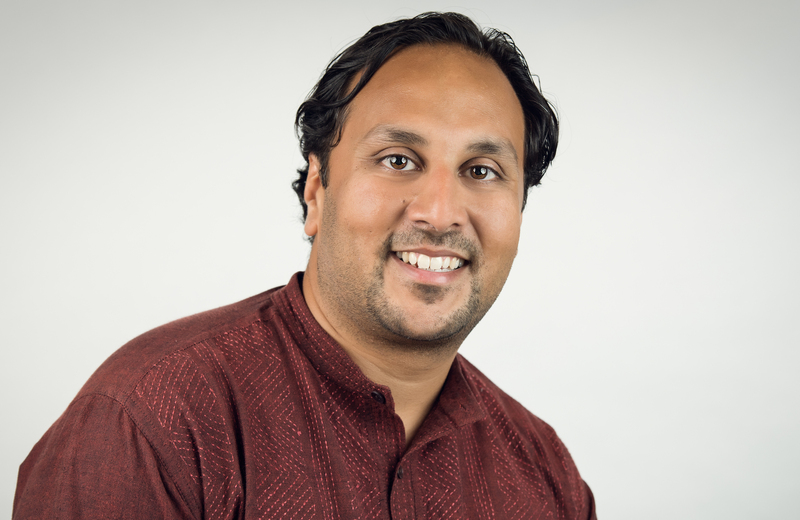 Amer is continuing this work as Director of Intercultural Teaching and Faculty Development at University of Massachusetts – Amherst, Faculty at the Summer and Winter Institutes for Intercultural Communication and a member of SpeakOut: Institute for Democratic Education. Amer’s is deeply rooted and committed to the empowerment of young people through unique approaches that seek to unlock their creative potential. Through engagement with new and social media, arts and facilitation; Amer is committed to lifting voices of the youth to create transformative change in the world. PURCHASE Ahmed's CD "Dawah: Storyteller's Bazaar"
"Thank you for your relatability, authenticity, and captivating presentation abilities in delivering this content. I overheard and engaged in many conversations throughout the institute on how your session had blown everyone's socks off, made us think, reconsider how we are serving students, and made attending the conference worthwhile. Seriously, your session made the entire (NASPA) Multicultural Institute experience worth it for me. " "Amer Ahmed was a phenomenal choice for our annual MLK Day program. 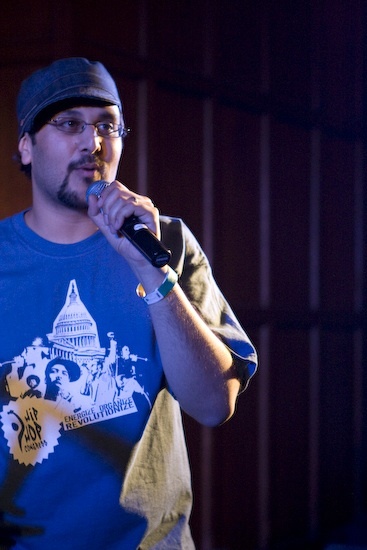 Speaking about the global intersections between hip hop and activism he connected with our students deeply in his workshops and informal conversations afterward. In a distinctively engaging way he invited—and inspired—students to think deeply about our world. We couldn't have asked for more." 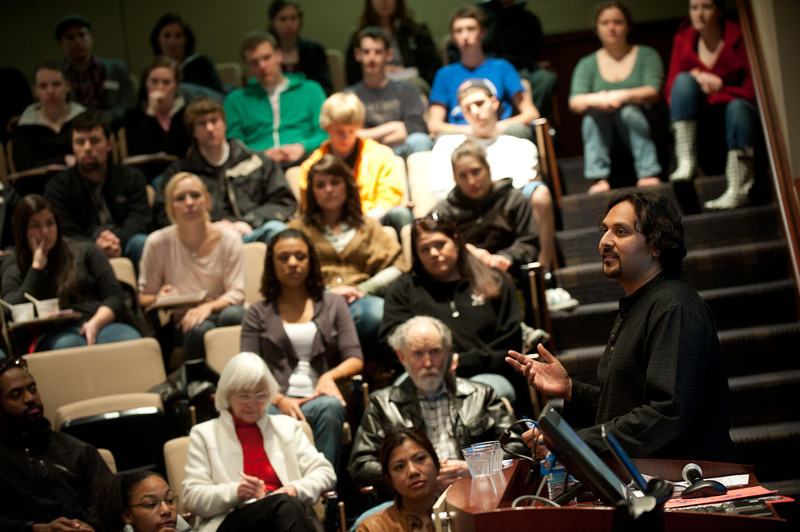 "Bringing a lecture about Islam and the myths and perceptions of the religion was truly amazing to have on our campus. What was great about the experience was that there were so many similarities to Christianity that the audience did not know about. What was also amazing is the conversations that continued to happen throughout the week about the event. 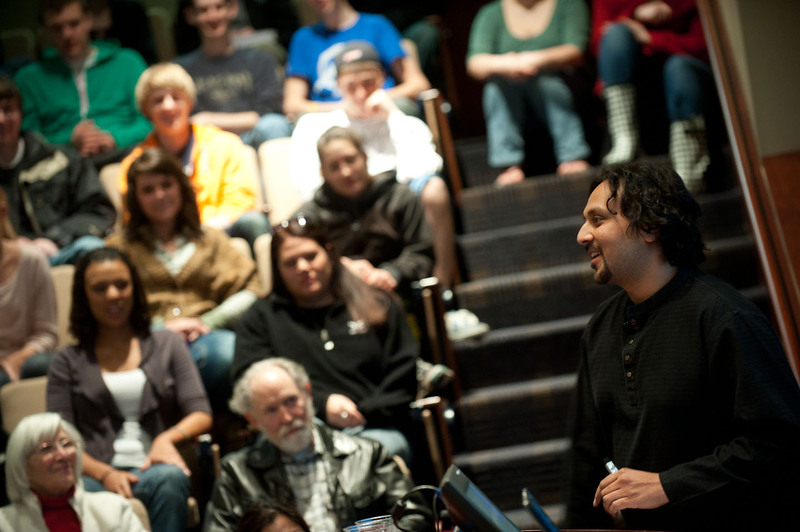 I would definitely recommend having Amer F. Ahmed on your college campus." "Islamophobia, one of the most important issues of our time, comes face to face with one of the most precise presenters on the topic. With extensive experience, fierce insight and bold intelligence, Amer F. Ahmed unravels the culture of fear—and misinformation—that too often dominates our national understanding of race, equality, citizenship and American Muslims." Dr. Ahmed draws from his diverse experiences across a range of higher educational and organizational settings to offer lectures, workshops, trainings, consultation, and facilitation. As educational institutions continue to cultivate strategies to create diverse and inclusive climates; there has been increased focus on student experiences in the classroom. This workshop will be an opportunity for faculty to engage the core intercultural skills that strengthen their ability to facilitate learning in diverse classrooms. In addition, faculty will consider what assumptions often exist in classroom settings and how to engage in pedagogy that can create a more equitable and student-centered learning environment. Finally, faculty will explore how to facilitate difficult conversations and other methods that support dynamic and inclusive learning environments for students. Intercultural approaches are often adopted by those in organizations who engage in international and ‘global’ efforts while Diversity and Social Justice approaches tend to be viewed as only applicable in U.S. contexts. As the trend of 'Globalizing’ Business, Higher Education and other sectors rapidly accelerates, there are many missed opportunities due to the lack of synthesis of the two approaches. This dichotomy often prevents us from understanding the relationship between local and global factors that impact our ability to engage constituencies holistically. For example, by engaging issues related to immigration and more specifically undocumented people in only one of these approaches, it prevents us from understanding the relationship between local and global factors impacting diverse contextual realities around the world. In addition, the integration of these approaches better highlights the historical context and inequities created from power dynamics that must be considered in order to effectively navigate intercultural realities in our world today. The post-9/11 era in the U.S. has exposed a significant degree of prejudice and bigotry towards Muslim people. More recently, the aftermath of the 2016 Presidential election has exacerbated the broad vilification of Muslims to serve political agendas. In 2012, a violent hate-motivated attack on a Sikh temple in Wisconsin highlighted the fact that Islamophobia is not just an issue that only impacts Muslims in America. Meanwhile, underscored by the horrific murders of three UNC students, there continues to be widespread racial profiling, hate crimes and bullying throughout the country and on our campuses. In light of this reality, questions remain regarding what administrators and faculty on campuses can do to proactively address these issues. This presentation will educate and update participants on the current realities related to Islamophobia and will challenge participants to develop practical steps that can be made on their respective campuses to address the issue. Among the array of perspectives on Leadership, most tend to focus on positional and individual achievement. These approaches to leadership typically reinforce the message that individuals should operate according to dominant cultural norms in order to succeed. What happens when we begin to conceive of leadership in a fundamentally different way that accounts for the need for intercultural skills? This workshop will engage participants in cultivating intercultural skills as necessary for effective leadership in the 21st Century. In this process, the goal will be to cultivate leadership that emphasizes community development, inclusion and equity rather than individual achievement. As commitment to quality education continues to lag in urban environments; educators continue to seek alternative methods to reach students who often come to classrooms with significant challenges. Hip Hop continues to be a powerful cultural force in the lives of urban youth and presenting opportunities to utilize unique pedagogies and methodologies to reach students. In addition, Hip Hop also presents opportunities in Higher Education to create diverse spaces that strengthen the overall educational development of students who often struggle to find comfortable cultural spaces on campus. This session will introduce participants to the fast-growing world of Hip Hop Education.